Revered as one of the great masters of Japanese ceramics, he makes traditional forms such as tea bowls, saki bottles, plates and vases in stoneware with simple glazes and sometimes scored markings. His works deliberately evoke a primitive essence of fired clay. In 1991 he was a demonstrator at the International Ceramics Festival in Aberystwyth. 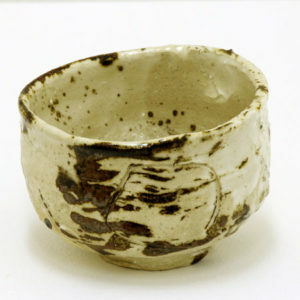 Hand built bowl in white stoneware with free scored design and brown and cream glaze with iron breakthrough.